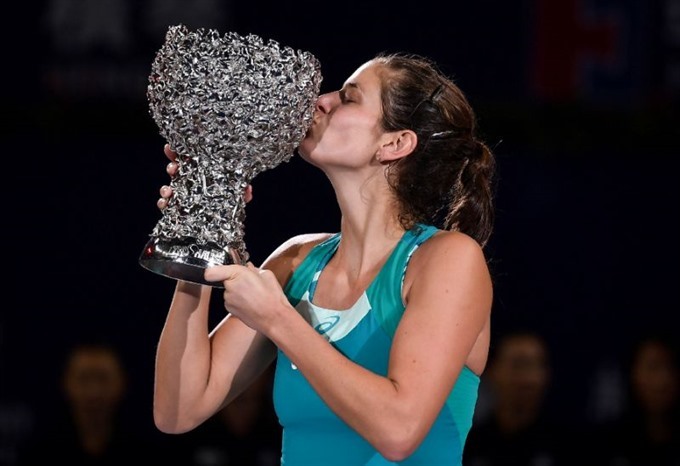 ZHUHAI, China — Germany’s Julia Goerges stormed to victory at the WTA Elite Trophy on Sunday, hammering number two seed CoCo Vandeweghe in the final to claim her second title of the year. With the title, which comes on the heels of a win in Moscow a fortnight ago, Goerges is set to end the season with a career-high ranking of world number 14. "There is no better way to end this season," she told journalists after the match. "I’m just happy. I think I have not really any words to describe right now. I think I still can’t believe it... It’s just amazing." Asked how she felt about receiving the trophy from tournament ambassador Graf, Goerges said it was "a very special moment". Goerges had enjoyed a smooth road to the final, seeing off Slovakia’s number one Magdalena Rybarikova, top seed Kristina Mladenovic and Latvia’s Anastasija Sevastova -- also in straight sets.